Some of the most classic elements of Venetian glass are combined into this one bead, which is why it is one of our favorites. 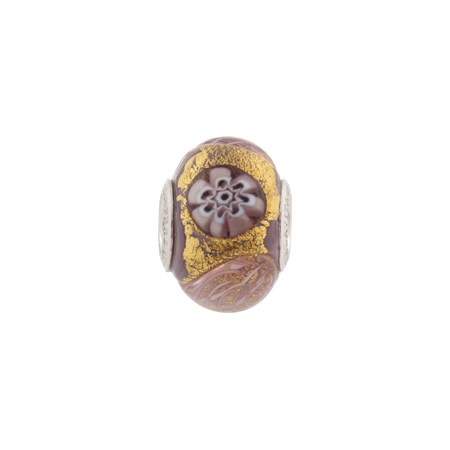 With pieces of zanfirico cane, slices of millefiori, and 24kt gold foil over a opaque amethyst base, this is one of the most beautiful beads we make and screams Murano glass like no other. Approximately 15mm by 12mm wide, with a 5mm hole and sterling silver inserts. Fits on Chamilia, Pandora, Troll, and major brands. Venetian Jewelry at its best. Complete with authenticity card.